Finally! Finally we’re both well, the boat systems are all working; almost, I haven’t yet run the water maker but I don’t believe there will be any issue there, and we are just waiting for weather. A cyclone formed NNW of us and we’re watching it. This place; Savusavu Marina has the newest moorings with 3 helix for each one and is quite well protected. Not the best protection in Savusavu but the most secure. So we wait. It looks like Monday the system will have moved S of Fiji and the weather will be calm. We plan on heading out to anchor off the Cousteau Resort; a pricey tourist spot that is NOT cruiser friendly, then from there head to Nisioni pass traveling along the S coast of Vite Lenua. This passage is one to have some respect for. 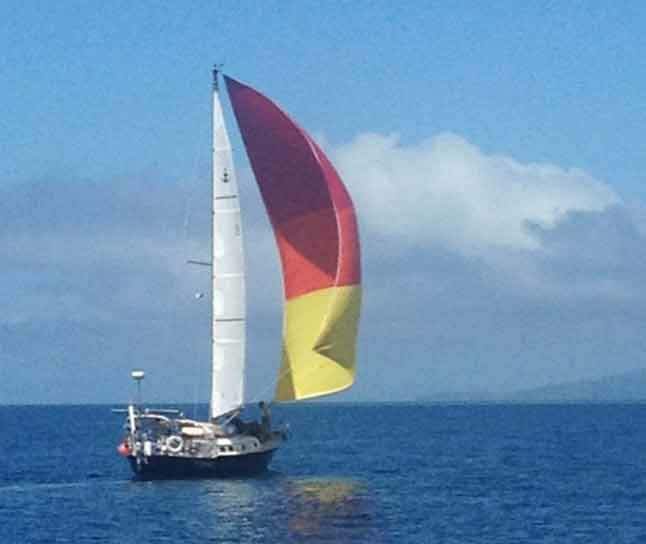 When sv Continium was leaving the Savusavu area they had some rough weather and pulled a winch off their mast necessitating a return to safe harbor. Truth be told they screwed up but those things happen when under a bit of duress. Well… the weather finally did as expected. We motored out to Cousteau and anchored 3 times trying to find a sandy spot. We never found one and listened to the chain gently rub on the coral all night. Unfortunately we had to anchor in about 20 meters of water and although we have plenty of scope for our system should the anchor be “stuck” I can’t dive that deep to free it. In American Samoa we purchased an electric snorkel but that too will only get me to about 12 meters, a bit shy. Yet we were lucky, the next am the anchor rose off the bottom with only a few minutes work tugging on the chain a couple of places it was wedged in coral. For those environmentalists that cringe about anchoring in coral; while we do our best to avoid it, here in the tropics the coral is healthy and need no encouragement for growth. If will soon grow back and cover up any areas we’ve messed with. We leave early the next day hoping to ensure entering the Nisoni passage about slack tide. While we hope the passage will not be as exciting as entering an atoll we understand there are rips out front and often a goodly current in the pass. After motoring 3 hours in flat seas (preferable to the alternative here, we reach the pass and luckily we find no obnoxious seas outside and only about 2 kts of current inside the cut. We had tried to pull out the headsail when we felt a slight sea breeze forming but traveling less then 2 kts was not going to help us arrive to time the passage and currents correctly. 30 minutes later we pulled in the sail and continued our motor boat ride to cross the first barrier of our trip to Nadi for the cyclone season. Again we could not find any sandy place to anchor. But we were blessed with almost no breeze that evening and being far enough from shore no bugs! And again we were in about 20 m of water with a coral bottom. Around the tropical islands it is so hard to find any anchorage without the coral bottom. A calm night with sv Spirare and sv Tamariki we all slept like babies looking forward to actually sailing on the following day. fully crewed, younger crewed boats. Serge and I were waiting a bit longer for the breeze to kick in and luckily it did. 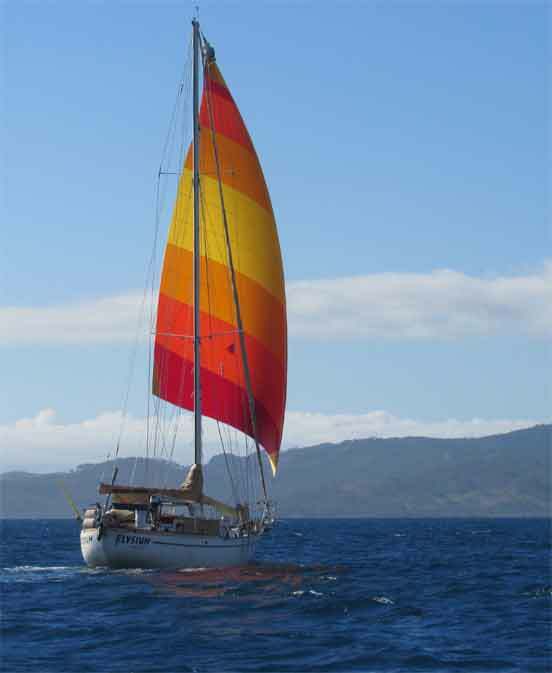 We all wanted a light air day so we could have a relaxing sail with our Spinnaker ( sv Spirare ) and us our drifter. The day was “quite pleasant” as W/ is fond of saying. The winds steadily increase all day long only near the end of the day reaching the point we felt it might be prudent to douse the drifter. However with one nm to go we flew it just a little bit longer and as we began to make our approach to the harbor we doused it and motored the rest of the way in. Oops, something is not right! The oil pressure gauge is reading low; 20 psi and we never run that low. I go to check down below. Nothing seems amiss in the engine room. No oil spraying anywhere, all caps firmly in place. I head back up worried. Seems with engines now I am almost always worried. Peter yells over and we can’t hear what he’s saying. I think he is saying we have no cooling water. Fortunately we are in the harbor where there is almost no wind and good water so we shut the engine down. He then indicates we have a sheet (line) in the water and I pull in the sheet and start the engine. Now the oil pressure gauge indicates what we normally see. Whew! After we’re anchored Serge swims over. We had picked up a small Tuna on the trip and were sharing it with the our two traveling boats. He swam just because he didn’t want to put the dinghy in the water! How lazy can we all get. He lost a bet the other day with Joann; Serge saying it only takes 15 minutes to nest and store it and Joann saying more like 30. Seems women often have a much better estimate of the work required around the boat than us guys. As the breeze continued to die and we settled in for the evening, we looked forward to crossing the Bligh waters tomorrow. The other two boats were splitting off not having our schedule and heading to Kadua while we were taking this opportunity of lighter than normal winds to cross this stretch of unruly water. Normally the winds are 10 kts more than predicted and the seas higher. We hoped to sail but if worse comes to worse we are prepared to motor. Taoism provide an interesting outlook on life. A way to see the good in the bad, a perspective. We met Logan (L) and Caroline (C) when they arrived at Shelter Bay Marina. Captain and Mate or Swab and Boss depending on who you talk to. They were taking the boat Blue Whale across the big ditch; the Panama Canal in about a week, and as happenstance would have it were looking for line handlers. W/ and I had been talking of the need to make a transit before we take our boat through and thus fate brought the 4 of us together. We signed on to be slaves to the Blue Whale and we would be transiting in about a week. Two days before the transit it rained. This wasn’t really a bad sign as we’re in the rainy season. Logan and Caroline or as Caroline prefers, Caroline and Logan, were prepping the boat. Wash, wax, polish, have measured for the canal authorities (you pay by length) , get tires (used as fenders) and long lines. The tires are to protect the hull and the lines needed for a transit must be 150′ in length. Intelligently they then purchased some T shirts from the KMart of Colon; Madison, for about a buck fifty each. One for each tire. One must protect the hull. The walls of the locks are much rougher than the hull of pleasure boats. One day before the transit it rained. Still, not a bad thing. In Panama it tends to rain mostly for two or three days, then clear up for a beautiful and hot day, maybe two. The Whale with her dinghy on the davits was too long and put them into a different cost group, needing an expensive pilot instead of the more reasonable adviser so they removed the dinghy to store it on the foredeck. Stacked on 3 huge fenders the dinghy would ride upright from the Atlantic to the Pacific pointing the wrong way. The day of the transit we were preparing Elysium for our absence and moving aboard the Whale. We’d baked some Brownies (in reality W/ baked and I ate) as of course brownies being a quality Junk food is in one of the major food groups and necessary for any passage. We helped C/L put T’s on the tires and tie them off along each side. Karen and Mark had now joined us and assisted in the final prep of the Whale. Boats transiting the isthmus need to have one Captain, and a minimum of four line handlers. We actually had a spare line handler. 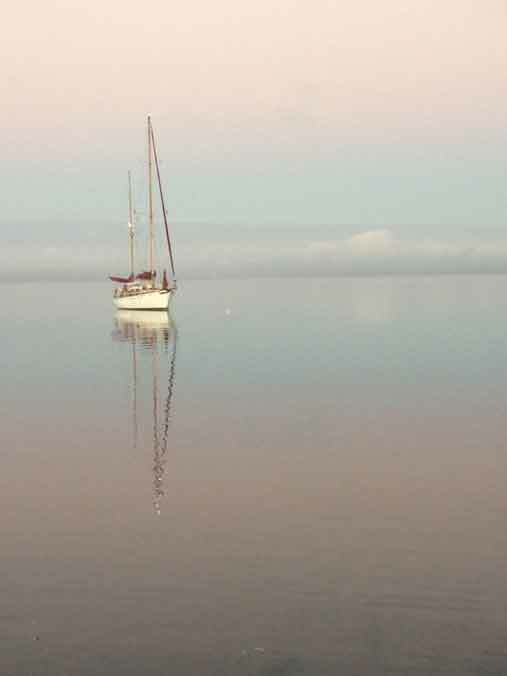 Ironically, back in the late ’70’s when W/ and I were first looking to purchase a sailboat we had taken our first vacation to Wrightsville Beach N. Carolina and then on to Florida. In Wrightsville Beach we looked at the hugely popular Westsail 32 and went on a demonstrator sail there. The Westsail Corp had recently opened up a new production facility there and had what they called a “Cruising Center” where one could see the boats, sail on one, and buy one; all of which we wanted to do. So we paid our money and a character not much older then us, Skip Fry, took us out for our 3 hour sail, AKA the Gilligan tour. It was a nice day, Sunny, relatively calm seas and we came away with the belief we could do this and this company had a boat for us. We had wanted the 42′ Center Cockpit (the one we have now) but Skip in a quite lucid moment had said “How soon do you want to get outta Dodge”? We could maybe, just maybe have bought the 42 and completed the interior; however, the 32 was more doable for a young couple like us, and the 28 would have availed us of leaving Dodge; well, we could have left much sooner. But the 32 it was and we ordered and bought and sailed Principia for 15 years and sailed her about 25,000 nm in that time. We never saw Skip again. We were checking out C/L on their website as I’m sure they were doing the same of us, when I came across an entry on the message board of an older Blue Whale site by…. Skip Fry. Now there can’t be many people in the world named Skip Fry so I asked Logan. He said, yeah, it was the Skip Fry who was associated with Westsail way back when. Such irony that he took us on our first 3 hour sail and he was actually to come do the canal transit with us. But, unfortunately Skip had some shore side duties that called and he wouldn’t be able to make it down for the transit. Thus Karen and Mark from Susurra were invited. Mark accepted and then Karen acquiesced (she was feeling a little under the wx) and so the 6 slaves of the Whale were gathering to take her from the Atlantic to the Pacific (the Blue Whales true home – Pun intended). In the am of Day Zero we had the tires on and the supplies loaded, it was blue sky’s, sunny, and looking like she’d be a sweet day to begin a transit. We had a group lunch to discuss methods and responsibilities of each station, expectations of the placement of the Whale in the locks and to share in a few more stories. We left lunch satiated and gathered any final items we needed prior to our meet on the Whale. Our transit time had been pushed ahead two hours over the last two days, today it was pushed back two hours and we would depart around 3 pm to head out to the “flats” and there we would pick up our adviser. 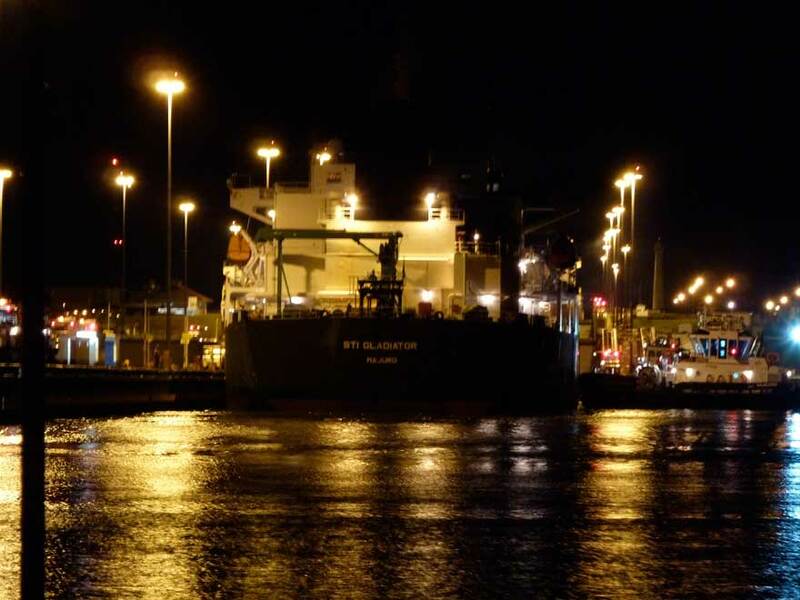 The adviser is the individual that connects with the Panama Canal lock masters and tells us what to do. Logan gets instructions from him (I’m not sure if there are any female advisers) and relays anything we need to us. The adviser has the paper work on the Whale and for every boat / ship transiting the canal during our passage. He knows who will be where and where we need to be to keep the function of the canal running as smoothly as possible. We were now to pick him up at the flats about 6 pm. We expected to be there early and were told in fact to be there early (I guess some boats just never show up, and so… we… would… be… there… early. were in the anchorage area and ready. They advised us that now the time of arrival for the adviser would be 6 pm. Now an hour later than when we had left. About 6 we called again and the adviser would soon come. He arrived about 7 pm and we picked up the anchor. (Note to self: I need to get our deck wash down in place before we make the crossing in Elysium.) The mud we picked up off the bottom I”m sure was imported from the Chesapeake Bay. It stuck to the anchor chain like glue and smelled like; well- I’ll save you the olfactory imagery. The only way to remove the mud was to flush with copious amounts of water. Another 30 minutes gone by, the anchor stored, the adviser was now on board and we motored out to cross the isthmus. We made good time to the first set of locks but there we had discovered we’d been pushed back another hour. The locks don’t stop for much, rain being one thing they don’t stop for; but, rain will slow transits down and so we had another wait. We were going to lock through behind a smallish container ship 700′ or so and they were having some difficulty getting it lined up to slide into the lock chamber. Now close to 9 ish (three hours later than our appointed time) we were slowly entering the first of 3 chambers that would raise us close to 100′. Once in the chamber and the doors closed our jobs would now be coming on line. 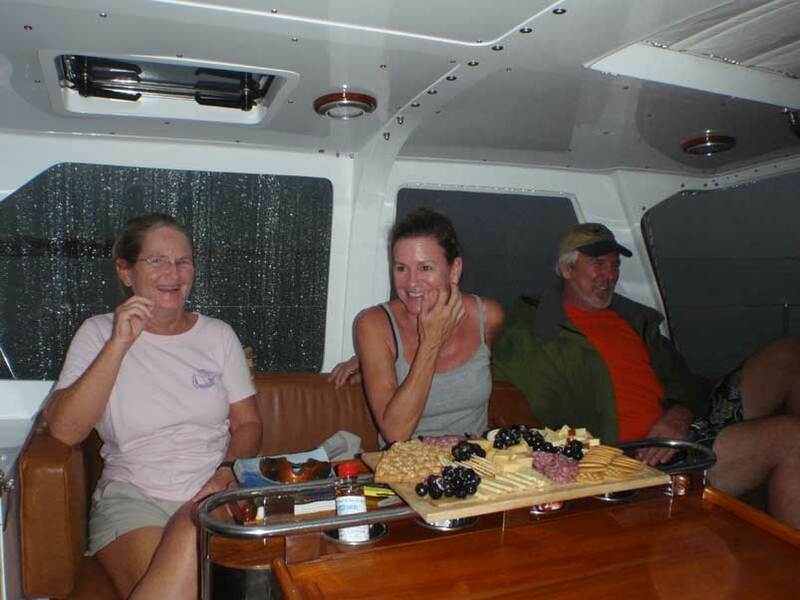 W/ and I had the stern quarters, Mark and the Boss (Caroline) were on the bow. Small lines with a tightly tied knot and a small weight inside called a Monkey Fist came flying (were thrown at the Whale) from the lock walls. Bow lines first and then the lines for the stern. Everyone tied the Monkey Fist to the 125′ lines and the handlers on the wall pulled the Monkey Fist with the now attached boat lines back up to the bollards. One of my knots let go! Oops. Franscisco (our adviser for this part of the trip) then helped, picked up the Monkey fist when it was tossed to the boat and I watched how he tied the fist to the line; a simple square knot. Now I know! Locking up is the most difficult part of the transit. When one locks up the line handlers get to work – literally. We were passing through what is called “Center Chamber” and so each corner of the Blue Whale had a line running to a bollard on the lock wall. As the boat rises, the lines slack, and the handlers (of which W/ and I were two of them) had to pull in the slack to assist in keeping the boat in the center chamber. There are three chambers we traverse rising approx 30′ per chamber. In one I watch as the water came in and we rose approx 7′ in 30 seconds. That’s moving! In the 2nd and 3rd chambers we rose about the same speed and W/ and I were getting feeling the strain of the wet stiff lines while continuously adjusting the lines trying to keep the Whale in the middle. Fortunately this was the last lock for the day and the last lock going up. We slowly followed behind the container ship staying as far astern of his prop wash as possible. Fransisco (our adviser on this leg) has us immediately turn outside the channel and head to a mooring buoy to the East. There we side tied to the buoy and about 10:00 pm we were finished with 1/3 of the transit. One third by work, not by distance. Of the 80 nm trek we’d gone less then 8 nm. A little after 11:00 pm. our adviser was picked up and we were discussing if we needed to eat or sleep. Food won the first leg but sleep eventually overtook us. We fell into our berths around midnight for a short sleep. The adviser for day two was arriving approx 6 am. Hopefully, that’s Caribbean time. You know, one thing about cruising and being retired is that you have time to do with what you want. Not always, but quite often. The other day I actually opened up my FaceBook act. I really don’t have a great deal of love for Facebook but so many people like it that you are almost dragged into using it. Almost. I opened it of my own free will. Then, there was a connection from my tennis coach that I hadn’t seen in a few years. He has my email, we’ve Skyped a couple of times (texting) and yet he seemed adverse to using just plain ol’ everyday email. So I accepted his “friend” offer and now we’re slightly more connected. He’s currently in Austrialia, getting married and if we’re lucky; when we get there, we’ll be able to see them again. But I wonder. I then replied to a couple of other communiques I had on facebook and the flood gates were opened. When I told W/ of all the requests we had (don’t get carried away it was only in double digits 🙂 ) she commented that it’s like a Virus. And that is so. Facebook gets hold of one friend and tries to tie them all together! But I digress. W/ decided that if I was there she should be too. I helped her set up an act and off she went. I think she now has more “friends” than I do which for any of you that know us is to be expected. But she’s gotten so carried away that she put up a bunch of pics that I’ve neglected to show. I was going to get around to it sometime! So she’s been addicted the last few days putting up the pics in Facebook. Since they are public and it saves me the work of posting the pictures elsewhere here is the list: People we Met, Shopping, Our Elysium, Me and My Gal, Cool Stuff (W/s opinion 🙂 ), Anchorages, Beaches, Wendy, Volunteering, Ocean Rowing, Gals, Tours, and Animals.